Shiraiwa-yaki ware dats back to about two handred fifty years ago. By going through the prosperity and the decline, today we maintain Shiraiwa-yaki ware Wahee-gama. In the late Edo period, the latter half of the 18th century, Shiraiwa-yaki ware was protected by the then Akita Clan, and started to be product on an industrial scale. At that time, the ceramic industry was flourishing in every part of Japan and each characteristic ceramic was made locally. In Japan the division of labor in the ceramic industry was established traditionally even in small potteries. One of craftsmen threw using a potter’s wheel, another craftsmen painted on porcelain, the others fired them with a kiln. Those were family-run potteries in most cases and had been inherited. In a big pottery, they needed to employ some non-family members to help produce ceramics. Each of the potteries was divided by classes. Some potteries in the upper class made wares for the upper ranges of society and the others made wares for commoners. Shiraiwa-yaki ware flourished as an industry through innovation of new techniques and with the increase in demand for ceramics. In the golden age, there were six Shiraiwa-yaki ware potteries. Although all of them were family-run kilns, it was said that in total there were six thousands workers, including participants. The success of Shiraiwa-yaki ware can be attribute to two main things. The first is the range of products produced. Shiraiwa-yaki ware provided items for both the markets of the elite and the masses. There were even special products for the local Sake in Akita. The Second was their recognition of pottery as a work of art rather than simply a tool. The habit of signing one’s work with a stamps of “Hanko” was unheard of outside of artistic circles and raised people’ awareness of its high quality. However, with the passing of time, Shiraiwa-yaki ware began to decline. Shiraiwa-yaki ware lost the support of their feudal lords and other potteries around Japan were able to out compete it. Moreover a big earthquake struck the area and devastated the six potteries. In the early part of the 20th century, all the kilns were closed. Seventy years later one woman, “Sunao Watanabe”, decided to revive Shiraiwa-yaki ware. She was one of the descendants of old Shiraiwa-yaki potters. Fortunately, the mingei movement which started several decades ago still had a big influence on society. The mingei ｍovement ( a Japanese term meaning “Folk Art Movement” ) happened by Japanese thinker Soetsu YANAGI(1889-1961). The philosophical essence of mingei is “hand-crafted art of ordinary people”. He discovered beauty in utilitarian and ordinary objects made by nameless and unknown craftsmen. Shoji Hamada (1894-1978) was one of the collaborators in this movement and Sunao Watanabe was greatly supported by him. 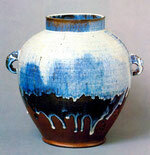 In 1975, Sunao revived Shiraiwa-yaki ware and worked hard with Toshiharu Watanabe whom she later married. In 1992, Toshiharu built a big multi-chambered climbing kiln, and now continues producing new works. From these beginning we produce designs inspired by our tradition and history but perfectly suited to modern life. Copyright (C) 2012 Shiraiwa-yaki Wahee-gama All Rights Reserved.